Allen sculpted at least three frogs, two were a pair of bookends and a third was found as a single clay amphibian sitting atop an attached clay base. His commissions list called it “Frog (large) for rock.” He mentions a frog fountain in his diary in 1912 in a list with the heading “Commissions beginning September, 1912” along with two other fountain pieces. Carrying that forward, he notes that he finished the frog on October 10th and took it home on the 14th to photograph. With the exception of a note that on 3/29/1913 he “Worked on base of fountain, (frogs),” there is no other mention of a Frog Fountain until he lists it in 1922 as having been paid $100. The frog is anatomically correct and looks quite healthy. Unlike his Crippled Frog Bookends, this creature is energetic and ready to leap off his perch. (For more about Allen’s animal sculpture work, see the Frog Bookends.) 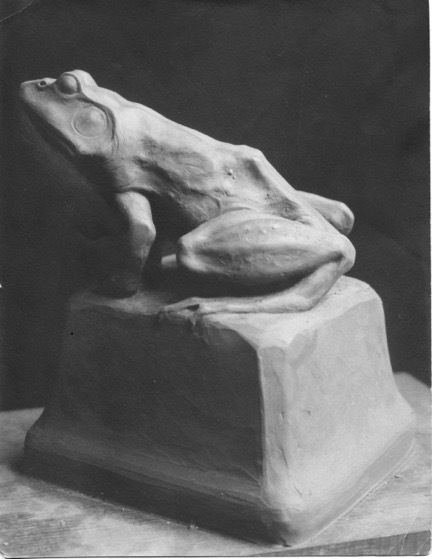 With this piece, instead of creating the figure of a frog to attach to a marble base or some other material, he merged the frog with its mount, positioning him diagonally across the geometric clay pedestal with beveled edges. This design counterpoint creates more interesting lights and shadows as the viewer moves around the fountain, each side presenting nuances in detail. Balance is achieved on the diagonal. In addition to its position on the base, the head projects dramatically off the edge of it, grounded by the backside of the frog crouched symmetrically at the opposite corner. Note the smooth, undecorated planes of the platform, contrasting with the textured skin, facial features and details of the figural work. The bone structure is prominent at the lower back and limbs and the musculature in the legs is dynamic. This frog is amusing. It isn’t basking in the sun; rather, it is spirited. Its forelegs lift his shoulders high, the head and prominent eyes strain forward toward its landing target and the hindquarters pushing the body forward from the feet and thighs. The whole figure is ready to jump, the claw of the back foot gripping the platform in preparation. It’s a charming piece.